Partitions on a set are dual to subsets of a set in the sense of the category-theoretic duality of epimorphisms and monomorphisms. 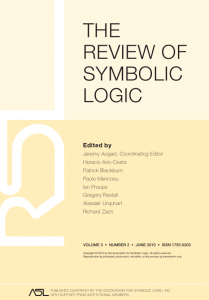 Modern categorical logic as well as the Kripke models of intuitionistic logic suggest that the interpretation of classical “propositional” logic should be the logic of subsets of a given universe set. The propositional interpretation is isomorphic to the special case where the truth and falsity of propositions behave like the subsets of a one-element set. If classical “propositional” logic is thus seen as the logic of subsets of a universe set, then the question naturally arises of a dual logic of partitions on a universe set. This paper is an introduction to that logic of partitions dual to classical “propositional” logic. The paper goes from basic concepts up through the correctness and completeness theorems for a tableau system for partition logic. (Reprint from: Review of Symbolic Logic, Vol. 3, No. 2 June, 287-350).